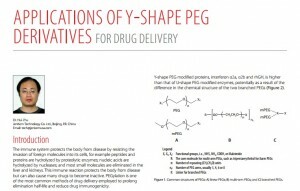 JenKem published “Applications of Y-Shape PEG Derivatives for Drug Delivery” review in Material Matters™. The paper features applications of Y-shape PEG derivatives in the biopharmaceutical area, including applications for PEGylation of cancer therapeutics, antibiotics, antivirals, and cocaine esterase. You may read the entire article starting on page 90 in Material Matters™ issue 11 number 3, or on the MilliporeSigma website. As a reminder, JenKem Technology and the life science business of Merck announced in September 2016 a collaboration agreement for the distribution of select JenKem Technology high quality polyethylene glycol (PEG) products for biomedical applications by Merck. With strategic international locations, Merck will offer JenKem Technology worldwide coverage, local sales force, and superior logistics. Merck will hold inventory of JenKem PEGS and ship direct using their excellent logistics systems. JenKem Technology Co., Ltd. and JenKem Technology USA, Inc., the sales subsidiary of JenKem Technology Co. Ltd., will continue to provide sales of PEG products and PEGylation services in small research scale where a customer chooses to work directly with JenKem Technology, and for bulk and commercial scale non-GMP and GMP grade products. Products distributed by JenKem Technology Co. Ltd. and JenKem Technology USA, Inc. will continue to be shipped to the customer directly from the JenKem Technology Co. Ltd.’s manufacturing facilities in Beijing and Tianjin P.R. China.